I’m Mia Ruiz, an AmeriCorps State Member through Arizona Serve, serving with Make Way for Books in my hometown of Tucson, Arizona. Recently, Make Way for Books celebrated their 20th anniversary of impacting over 30,000 young children, families, and educators per year, with a Love of Literacy Luncheon, hosted at the Tucson Convention Center on Valentine’s Day. I had the privilege of giving the last speech at this even which contributed to over $62,000 raised for my site. Over 400 guests were present, all of whom contribute to Make Way for Books’ mission of giving ALL children the chance to read and to SUCCEED. This is my story of how I became a part of this organization, and the impacts this experience has had on my life, and the growth of my daughter. Our family will forever be indebted to Make Way for Books… not only for supplying our daughter’s library at home with 85% of its books throughout the last 3 years, but for infusing more love into our lives beyond the scope of literacy. I’ve always appreciated the phrase “Share Stories Change Lives” used by Make Way for Books, because it’s helped me grow as an individual and parent, in realizing that being vulnerable is healing as well as liberating, and not degrading..
Our first interaction with Make Way for Books was at the beginning of a Raising a Reader cycle they conducted at Manzo Elementary in January of 2015. My daughter, Brissa, had just turned one a month before. Throughout that first year our family had gone through a lot, more than the “typical” milestones. Hours after giving birth to Brissa, I hemorrhaged, was bed ridden, in and out of consciousness for days and received two blood transfusions. Brissa thankfully was healthy and discharged from the hospital before I was. Not being able to hold her unassisted for days, her first days, and not having those first precious moments I had dreamed of, tore me apart. The traumatic experience left me with guilt, anxiety, fear and shame; I was diagnosed with severe postpartum depression. I felt as if my bond with Brissa had been tainted or stolen. I decided to become a stay at home mother and not miss any more precious moments. Throughout that first year our bond was strengthened and now we just needed to get out of the house more, for both of our developmental processes. So, we ventured off and Needless to say, we LOVED the experience Make Way for Books gave us. We returned for an almost embarrassing number of Raising a Reader Cycles throughout that year, and then transitioned to attending the Friday and Saturday story times so that her father could experience and enter into our little world. Make Way for Books’ strategy made me comfortable to attend and we kept returning because the way it bonded my daughter and I, and then essentially all three of us. It was something we could do together that had SO much meaning for us, more than Make Way for Books’ staff ever knew. The progress and memories we’ve made because of them are just as prized if not more, than the educational benefits she’s acquired through their programs. Make Way for Books is my daughter’s FAVORITE place in the world to go, only second to Disneyland and just before camping! It’s part of every parent’s dream for their child to have a love for learning, and Make Way for Books helps instill that love perfectly. Our daughter LOVES books! Books for us now symbolize togetherness, with Brissa having grown up thus far an only child; we sense that books can also symbolize companionship for her, alleviating her solitariness. We’ve also learned how to confidently, better support her love of reading and learning especially by showing her that she can relate things to the stories in the books we share with her, like songs, art, animals or everyday things and events. The benefits from those connections that Make Way for Books have given her and us as parents as her first teachers are monumental. All of us parents are eager for our children to learn and have opportunities they deserve. I’m honored to now be a part of the Make Way for Books’ team as an AmeriCorps State Member. I am a Parent Leadership Associate. I’m helping Make Way for Books co-design a strategy for parents. Now, I can give back what I’ve gained as a participant. I’m able to advocate for parents like myself as an ambassador. I’m grateful for an opportunity to show other parents their power to create opportunities for their children. The objective of the program that I’m co-designing is to break the cycle of intergenerational poverty in our community. One in five children is born to a single mother without a high school education and 38%of new mothers have a high school diploma or less and 52% of children living in Pima County are part of low income households. By age 3, children from homes in poverty hear 30million fewer words than their more affluent peer and by Kindergarten they’re typically 2 years behind in vocabulary and pre-reading skills, and have lower test scores. These early disparities are linked to continued struggles in adulthood. The lives of children and their parents are interdependent. Motivated by their children, parents are a tremendous catalyst for creating a brighter future for their entire family. Through this program, children access quality early learning experiences and parents build core skills in being a change agent in their child’s life and education, such as advocacy, empowerment and positive relationship building from the community among parent cohort participants. 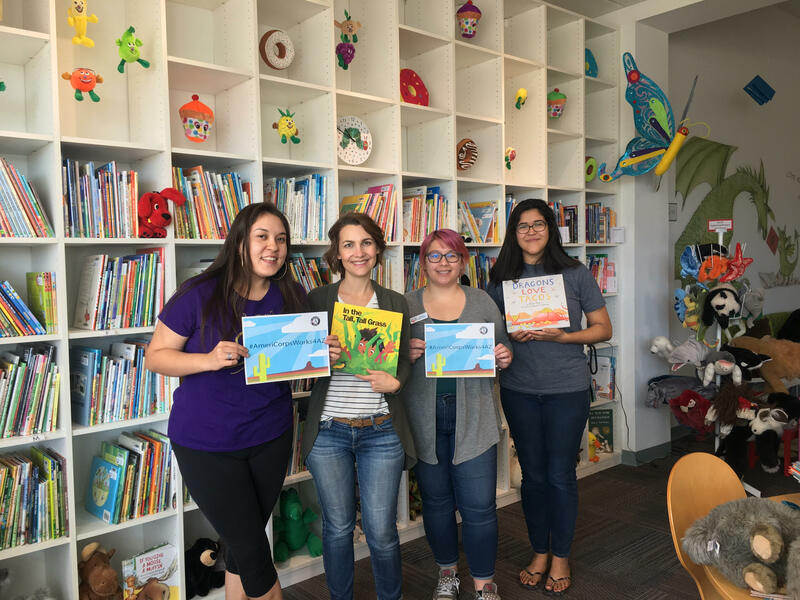 My experiences and passion for supporting others who have similar stories is what drew me to AmeriCorps, being able to provide service through Make Way for Books brings everything around full circle and is more meaningful.